Check out Alex, Jonathan and Nicole Nomer’s testimonial about their beloved Magnum 35′! 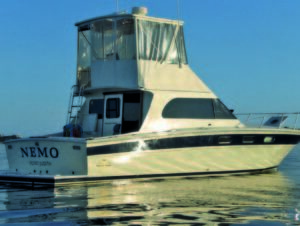 In September 1995, I came across a classified ad in Soundings for a 1971 35’ Magnum. This was the smallest ad you could purchase. I called repeatedly and finally connected with Henry at Henry’s Anything Marine, a marine recycler. Henry and I talked about the boat, and my wife, Nicole, and I decided to have a look. We had to travel from Connecticut across the Sound, and when on the other side, we called to say we were on our way! That gave about an hour for a cleanup to happen, but not enough time to hide any major issues, if there were any! What a mess! The place, the boat, the guy… all of it. Nicole is such a great sport and, like me, sees through the fog to the potential. We fell in love with Die Götterdämmerung (ex Holy Smoke), but not with the name. It took some interesting persuasion and negotiation before we finally agreed on a price. You could say we rescued a vessel that had one foot in the scrap yard. And now, after the restoration… Nemo was really alive! !